The end of Lap 1 of Conor's heat race. Peter leads towards the end of his heat race. Conor on the pole for the start of his feature race. Conor leads through Turn 10 (the first corner for a reverse-direction event). Conor leads through Turn 9. Conor leads comfortably during the opening laps of his feature race. Peter on the grid for his feature race. Peter leads the field through Turn 1 toward the start of his feature race. Close racing on Lap 9. Peter with the checkered flag. Peter's lap time for Lap No. 7 of his feature race was sub-46.2 seconds - a personal best. A group of us traveled to Indianapolis from Columbus for the opening-day showing of the movie "Senna" (http://www.imdb.com/title/tt1424432/) at the Keystone Art Cinema. We got together for dinner before and indoor kart racing at FasTimes after (http://www.fastimesindoorkarting.com/). Click to enlarge or play. Keystone Art Cinema in Indianapolis. Conor's "adopted" sisters, Dana, Julie, and Tracy. The Conlin sisters with dad Jim. Conor had not only the fastest time of the day and the week, but also the second fastest time of the month. 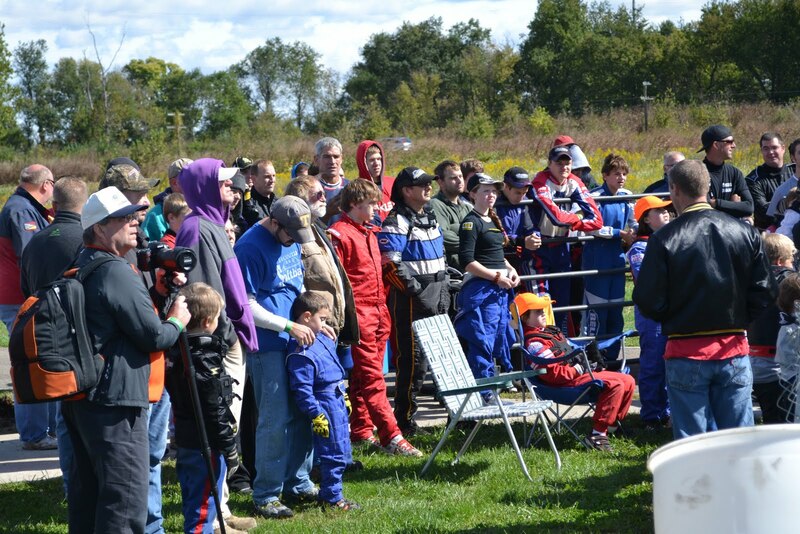 NEWS – We had a very eventful day last Saturday at Mid State of Ohio Kart Club (MSOKC) Race No. 9, which was an under-the-lights night race at Circleville Raceway Park on August 20, 2011. I didn’t have time to take many notes, and this was our fourth race weekend in a row, so what appears below is how I remember it. PRACTICE – After Race No. 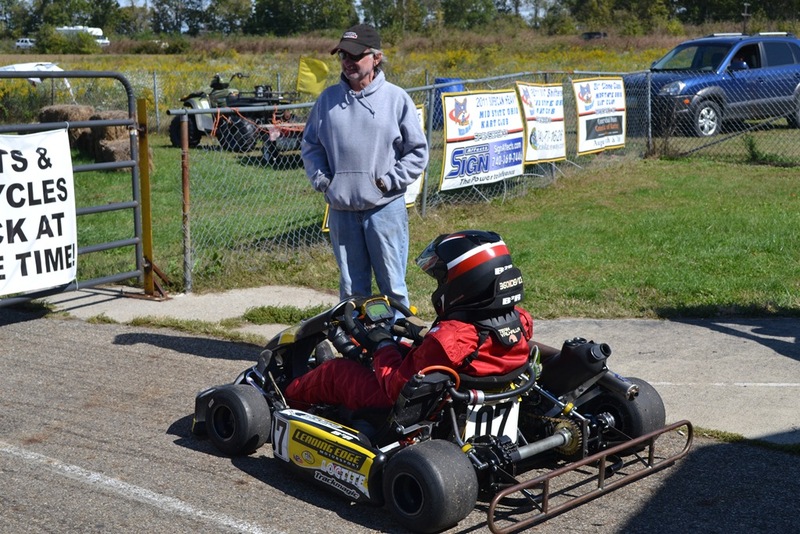 8, we rebuilt the carburetor on Peter’s kart and mounted up a set of lightly used tires. On Conor’s kart, we rebuilt the fuel pump and, in our continuing our quest to sort out the problem that causes his front brakes to drag when they heat up, replaced the pins that hold his front brake pads in place. We wanted to try out these changes before the official practice sessions got underway, so we arrived at the track about an hour early on Saturday. Both karts ran great the first time out. On Peter’s second run, he came to a stop at the end of the long back straightaway. Thinking he may have just spun and stalled the engine, I took the starter with me when I went to retrieve him. He reported that the engine just died, so we loaded him up and returned to the pits where we realized something was seriously wrong. The crank would not turn. We took the cylinder head off and discovered that the piston was no longer pointing in correct direction. As we continued to disassemble the engine, we discovered lots of big chunks of aluminum piston and miscellaneous bearing components in both the intake and exhaust side of the engine. As David Hobbs says on SpeedTV’s Formula 1 coverage, it went ka-BLAM-o. .After a few inquiries around the pits, we found a fellow competitor who was more than happy to loan us their back-up engine for the day. It had recently been assembled using spare parts and they were anxious to see how well it would run. With the help of several volunteers, we frantically swapped engines and got Peter out for one of the regular practice sessions. On his second lap, he came to a stop in Turn 3. Being optimistic, I took the starter with me again. I decided that, since this was not our engine, we should load him up and investigate in the pits. When we did, we discovered… …another ka-BLAM-o. Not as catastrophic as the first – a skirt had broken off the piston – but this wasn’t even our engine! As we were investigating, several other competitors offered the use of their spare engines. I was just about the throw in the towel when one insisted that we use theirs. I hadn’t even had the chance to mix fuel yet, and it was getting close to race time, so the boys assured me that they would do most of the work if we would give it a try, which is what we did. The work was completed, again with the help of volunteers, just in time to allow Peter to have a few practice laps prior to the driver’s meeting. This engine was not configured for Peter’s class when it was presented to us, so we used our carburetor, exhaust, and clutch, and it actually ran fairly well. SPEC 100 PIPE – There were only four karts in Peter’s class on Saturday. I can’t remember where Peter started in his first heat race, but he finished the first lap in third. He made a pass on Lap 4 (of eight) and finished second. Peter also finished the first lap of his second heat race in third. He hung with the leaders until Lap 5 or so when he began to fall back. His fastest lap was his second (46.425 seconds), which was only 0.2 slower than the blistering lap he recorded the weekend before (46.226). In his feature, Peter started and finished third, again hanging with the leaders for a while and then dropping back. Not a bad result for a day in which he was fortunate to be racing at all. Best of all, the second borrowed engine can be returned in one piece. 80cc SHIFTER – Four race weekends in a row must take its toll on not only us, because there were only six karts in Conor’s class instead of the usual 8 to 10. Conor started his heat races from the middle of the group – fourth in the first and third in the second. In the first, he gained one position at the start and ran in third until the leader spun on Lap 3. 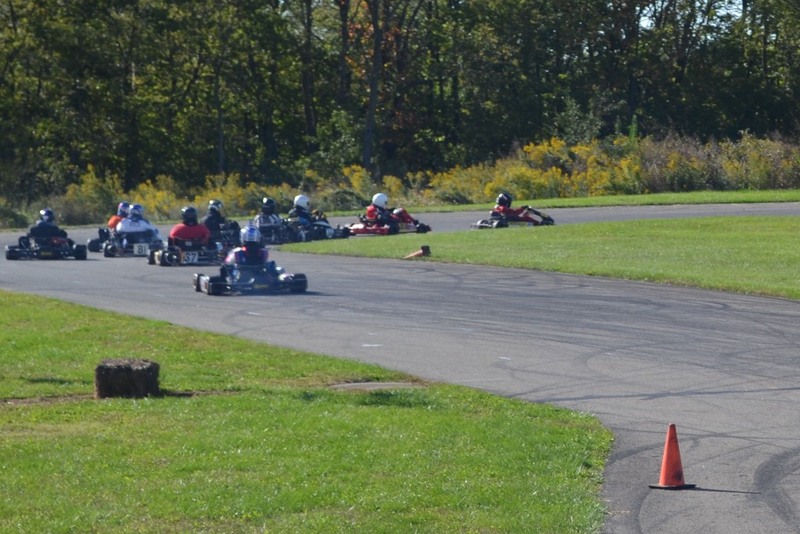 While Conor was working on getting past the new leader, the third place kart slipped by on the inside in Turn 7. Conor worked his way back to second on Lap 5, which is where he finished. Conor made a great start in his second heat race, but unfortunately the pole-sitter in front of him did not. Conor had nowhere to go and lost two positions in the process. He made a rare double pass on Lap 4 which promoted him to second. The leader had gotten away by that time, and while Conor did catch up, he ran out of laps. Starting from second in his feature, Conor made another great start and was in the lead by Turn 3. He extended his lead by over a second per lap over the first seven laps (of 10). With a massive lead established, he finally slowed down on Lap 8 to save his tires. This was Conor’s fourth MSOKC feature race win in a row and his fifth of the season in nine events so far. NEXT RACE – Peter may be done for the season. His engine is on its way back to the engine builder for an assessment, but I suspect that the damage may be terminal. Even if it can be rebuilt, the cost is likely going to be beyond what remains of our budget for this season. Our next race is MSOKC Race No. 10 on Saturday September 3, 2011. This will be a qualifying format event at CRP that follows the normal Sunday (day race) schedule to allow time in the afternoon/evening for the annual MSOKC Hog Roast. There will be plenty of food for everyone, a variety of games, and a Powder Puff race in the rental karts for wives, girlfriends, and mothers of the regular racers. Hopefully we can talk Laura into doing this again. MSOKC Race No. 8 – August 14, 2011 – Double Win!! 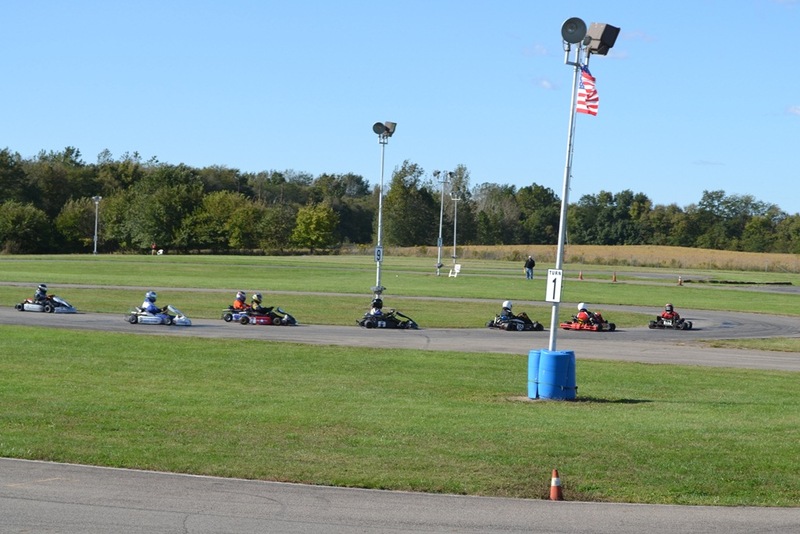 NEWS – Mid State of Ohio Kart Club (MSOKC) Race No. 8 last Sunday was the third race weekend in a row for Bruce Brothers Racing. 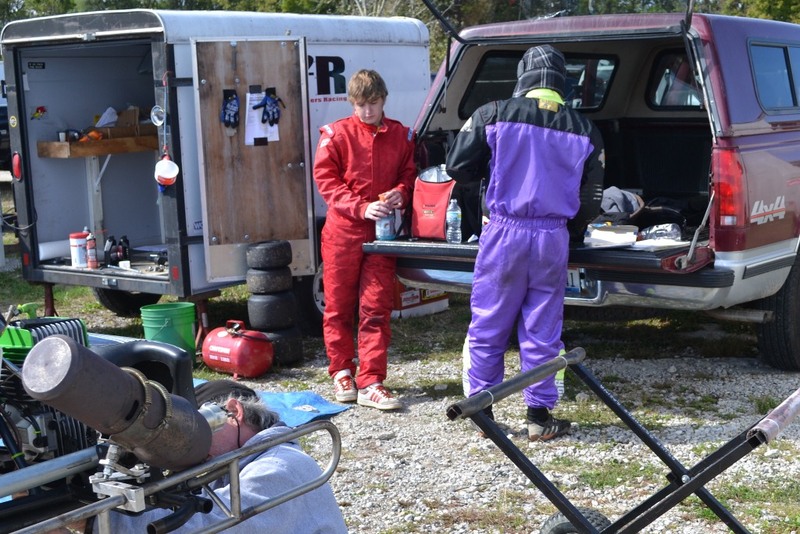 Much had to be done to return our karts to their regular club racing configuration at Circleville Raceway Park following the Commercial Point Grand Prix. While the CPGP does take its toll on the equipment, we were fortunate to avoid any major crash damage. PRACTICE – The weather forecast for Sunday called for cloudy skies and a 70% chance of rain. While the track was damp when we arrived, and it did sprinkle towards the end of the day, it turned out to be a nice day for racing. Our first practice sessions were used as shakedown runs to try out all the reconfiguration that was done. Our tire budget is getting a bit thin, so we elected to go with used tires on both karts for Race No. 8. To make the best use of used tires, we flip them around on the rims so that what was the outboard side becomes the inboard side. Both boys spent their second practice session breaking in their flipped tires. SPEC 100 PIPE – As the season has progressed, there are five karts that have consistently shown up for almost all of the events in this class. This was the case again on Sunday. 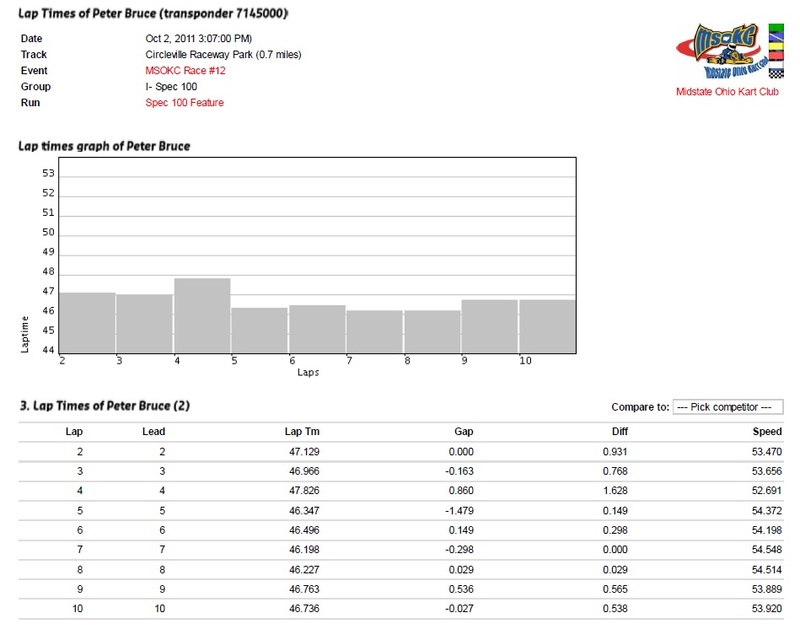 Peter drew the fifth starting position for his first heat race and improved one position at the start. He spent the next eight laps nipping at the heels of the pack in front of him, who were fighting it out amongst themselves, but was unable to improve further. Starting on the pole in his second heat, Peter got snookered at the start and settled in to second position. He dropped two wheels into the grass on the exit of Turn 4 on the first lap, which cost him another two positions. He gained one back on Lap 2 and another on Lap 4. He caught up with the leader towards the end, setting the fastest lap of the race in the process (46.397 seconds), but finished second. The leader had lost a lead weight off of his kart on the last lap and was disqualified at the scales for being underweight, which gave the win to Peter. A fourth and a first earned Peter pole position for the feature. An excellent on-board video of Peter’s feature race from the perspective of the second place starter can be found here - http://www.youtube.com/watch?v=ycxOEEMLylc. Determined to avoid getting snookered again, Peter drove deep into Turn 1 at the start – a little too deep. The second place starter was able to get by on the inside, which dropped Peter to second. He got a good run through Turn 4 on Lap 2 and was able to regain the lead in Turn 5. From there he just took off and never looked back. His fastest lap was on Lap 3 (46.226) and was the fastest lap recorded by anyone in this class this season. 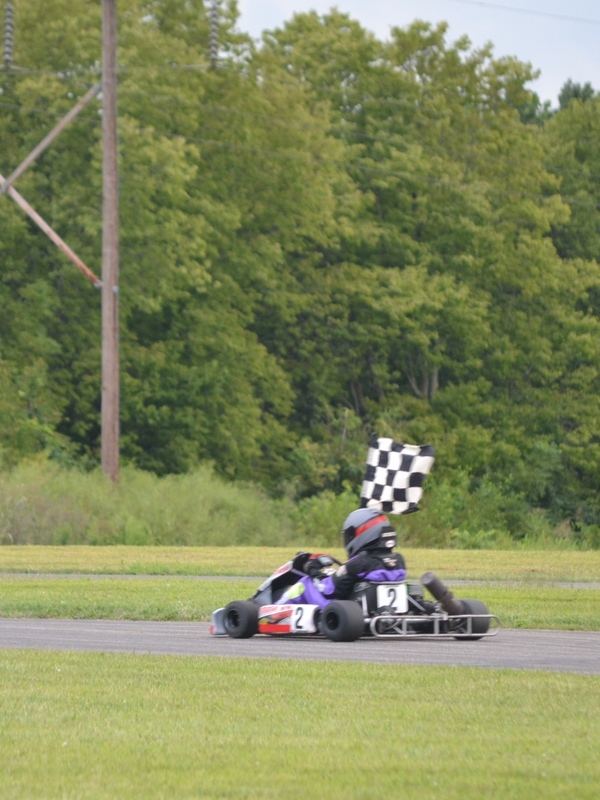 This was Peter’s first feature race win in an adult class – way to go Peter! 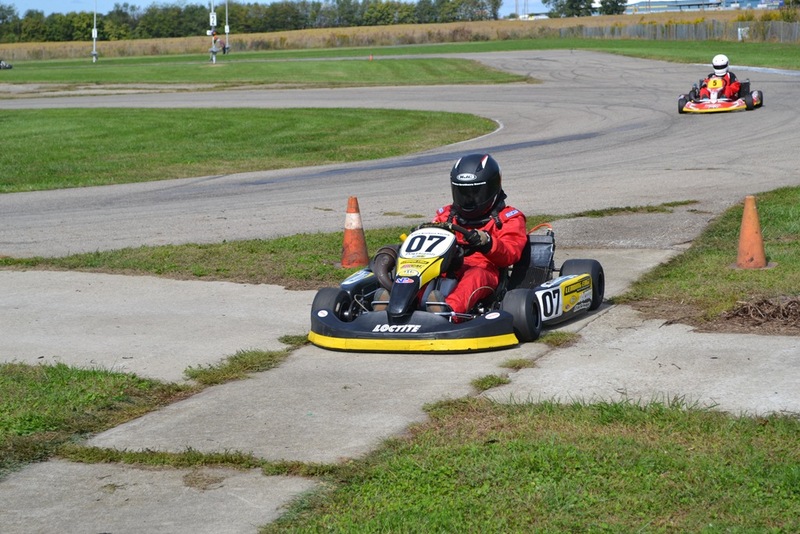 80cc SHIFTER – The number of karts in Conor’s class has varied widely this season – from a high of 10 to a low of six. There were eight on Sunday, and since more championship points are awarded for well-attended races, there were a decent number of championship points on the line. Conor’s first heat race was a lot like Peter’s. He started fifth, made one pass early, and then got bottled up behind two karts that were fighting among themselves. Conor made a great start from fourth in his second heat race and finished the first lap in second. He was passed by the eventual winner on Lap 2 but passed another kart on Lap 3 to regain second, even though his lap times were a bit off. A fourth and a second were good enough for the second starting position for the feature. He maintained his position at the start, but in Turn 10 on the first lap, the leader pulled off with a broken transmission. Conor was able to pull out a bit on the second place kart over the next few laps only to get reeled back in again. On Lap 9 (of 10), the second place kart slid down the inside in Turn 7 only to have Conor muscle his way back to the lead in Turn 8. Conor held on for the win, which was his third feature race win in a row – way to go Conor! NEXT RACE – This event was the first double feature race win for Bruce Brother’s Racing since Conor and Peter did it at MSOKC Race No. 12 on October 5, 2008. Our next race is MSOKC Race No. 9 on August 20, 2011, which is another Saturday night race at CRP. Gates open at 1:00 PM and racing gets underway at 5:00 PM. This will make four race weekends in a row for us, one of which was a double-header. We’re all looking forward to the two-week break that follows. 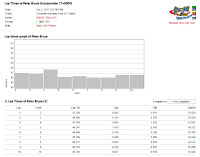 p.s., Lap times, lap charts, and results can be found at http://www.mylaps.com/results/showevent.jsp?id=700431. Click to enlarge or play. Henry (#2H) on the cover of the program for the 2011 CPGP. This picture is from the 2009 event. Peter enters Turn 4 during his Merchandise race on Saturday. Peter preparing for the start of his Trophy race on Sunday. Peter leads a traffic jam through Turn 1. Preparing to have a broken seat strut on Conor's kart welded. Conor chasing down the leader during his Merchandise race on Saturday - 1 of 4. Peter on the podium after his Merchandise race. Conor on the podium after his Merchandise race. Video of the start of Peter's Trophy race on Sunday. NEWS – Another great time was had by all this year at the Commercial Point Grand Prix of Karting. Even the weather cooperated – for the most part. The circuit was again the revised six turn 0.5 mile course that winds through the streets of Commercial Point, Ohio. 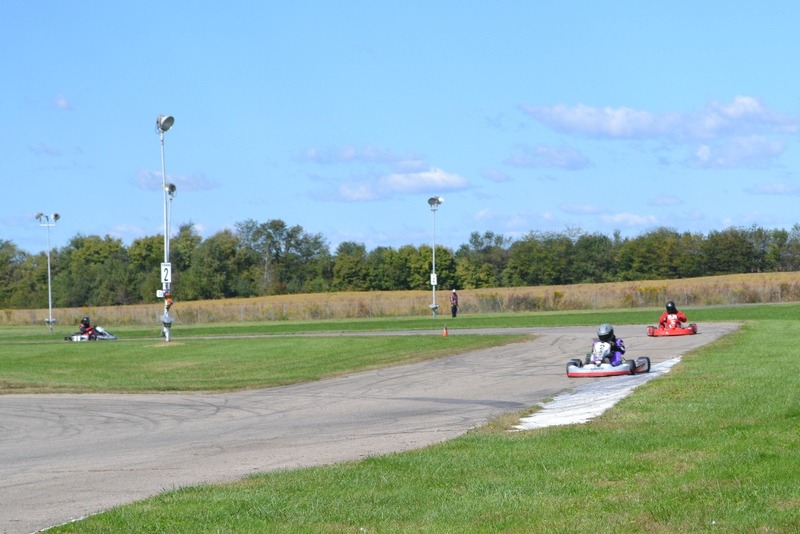 The front straight is 900 feet long, which results in top speeds 75 mph in the faster karts. The course is lined with an impressive number of straw bales and plastic drums. The CPGP does not offer the adult class that Peter has moved into for our club racing, so we had to reconfigure our Yamaha Spec 100 Pipe kart into a SuperCan Lite kart for this event. 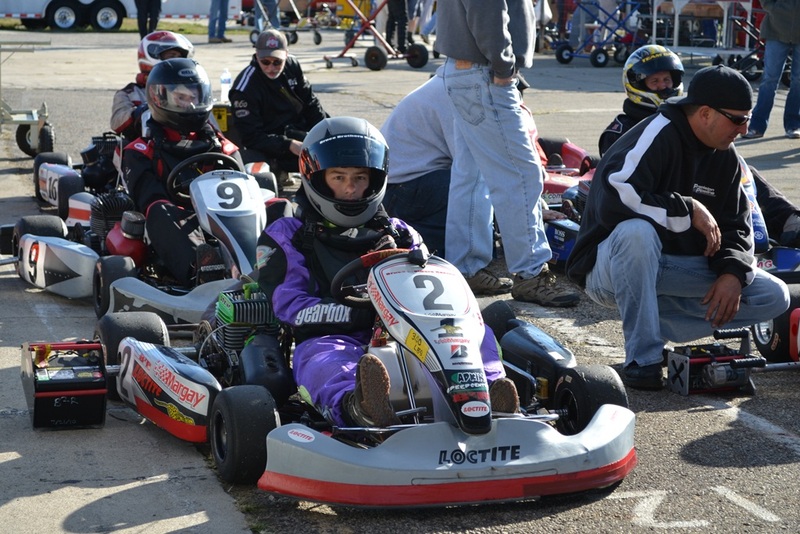 Conor once again competed in the 80cc Shifter class, including the Pro race for this class. PRACTICE – Two rounds of practice took place on Saturday with best times from the second session determining starting positions for the Merchandise races later on Saturday. Finishing positions from the Merchandise races determined starting positions for the Trophy races on Sunday. Both boys had a lot to get used to during the practice sessions; the course and the stickier MG “Yellow” tires that are allowed for the CPGP for both, the reconfigured kart for Peter, and new brake pads all around for Conor. Peter did well in his first session, but had a problem during his second. We had made a gear change just prior to this session, and somehow, the bolts didn’t get tightened. He got through the first few laps before the gear came loose, throwing the chain and bringing his kart to a disappointing stop (see photo sequence in earlier post). With only a few laps in the bag and the track getting faster as more rubber was laid down, Peter qualified only ninth (of 15 in his class). This would set the stage for an exciting Merchandise race for him, however. When Conor applied the brakes for the first time going into Turn 1 (at about 70 mph), the new pads on the front left grabbed before the ones on the right and just about threw him into the bales. He nursed it around for the next few laps until they seated in properly. There were only four karts in Conor’s class this year, which was a bit of a disappointment. In his second (qualifying) session, Conor held the fastest lap at several points, but ended up second, just 0.1 second behind the eventual pole sitter. He reported that several of his laps were spoiled by a random downshift that he didn’t order. We traced the problem to a broken seat strut, which was allowing his seat to hit the gear-shift linkage over the bigger bumps. Having this welded involved removing and reinstalling the seat before Conor’s Merchandise race, which was a bit frantic but was completed with time to spare. YAMAHA SUPERCAN LITE – Knowing that he had his work cut out for him starting in ninth, Peter’s objective for his Merchandise race was to make at least one pass. He got away well from the Le Mans-style standing start and entered Turn 1 where he started; in ninth position. We had obviously made some good decisions regarding setup, because he was able to make a pass going into Turn 1 on the second lap. He was able to do the same thing on the next lap, which brought him up to seventh. He made two more passes on Lap 5 and another on Lap 9 (of 15), bringing him up to fourth. The closer he got to the front, the more difficult the passes became. 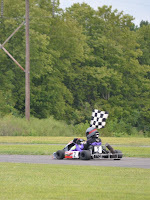 He made another pass for third on Lap 14, and had the second place kart in his sights when the checkered flag fell. He was obviously very pleased to have underestimated his potential in his first year in an adult class at the CPGP. Peter’s Trophy race on Sunday was also exciting. Starting from third, he held his position at the start. He made a pass for second going into turn 1 on Lap 4, but got crossed up on the exit and let two karts get by. He regained one of these positions with another Turn 1 pass on Lap 5. He repeated this move on Lap 7 to move into second. We had made another gear change for the Trophy race, and it may have been a bit too much. While it got him into second place, he couldn’t quite shake the two karts behind him. One of these hit the bales exiting Turn 6 on Lap 13. While Peter and the third place kart were catching the leader, Peter had to do everything he could to keep the third place kart behind him. 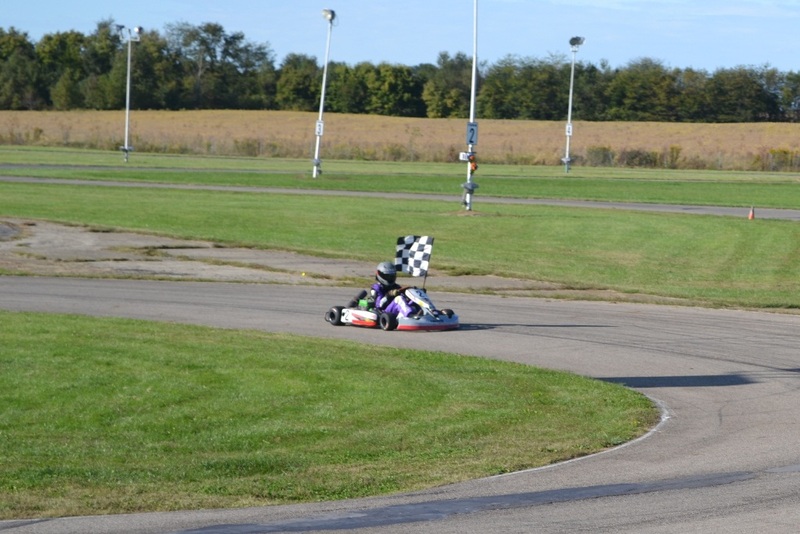 The third place kart gave Peter a big bump in Turn 5 on the final lap, but Peter was able to hold on to second at the finish – by a less than 0.1 seconds. 80cc SHIFTER – Since the shifter karts have manually operated clutches, they use Formula 1 style starts as opposed to Le Mans style. Conor got away well in his Merchandise race and set out after the leader. These two were never more than a second apart, but Conor didn’t have the speed to challenge for the lead, even though he did record the fastest lap time on the final lap (31.736 seconds). I suspect that the brake problem he had earlier in the day was having an adverse effect on his confidence. During the single practice session on Sunday morning, Conor pushed a little too hard and clipped a bale on the exit of Turn 6, which bent a tie rod and a spindle, which ended his session early. We made the necessary repairs, but in his Trophy race on Sunday, it became apparent that something was not right. It turned out to be a brake problem again. He lost a position on Lap 2 and ran a lonely race in third to the end. For Conor’s 20-lap Pro race, we managed to fix the brake problem and we made a gear ratio change to help him get out of Turn 6 a little better. At the start, he bogged the engine down and fell from third to fourth. He made a pass for third in Turn 1 on Lap 3. On Lap 4, the leader (and winner of the Trophy race) pulled off with mechanical problems, which promoted Conor to second. The new leader had about a half-straightaway lead by then, and while these two traded fast laps (Conor’s best was a 31.670), Conor was unable to close the gap significantly. That Conor was able to do as well as he did was due in large part to the eventually winner, who just happens to be the welder who fixed his broken seat strut. I suppose it would have been in bad taste to have beaten him, but I doubt that Conor was thinking about this at the time. Conor’s second place finish in the Pro race earned him a cool $250 while the winner took home $500. NEXT RACE – As we were watching the last two Pro races after Conor’s, the sky darkened and the wind began to pick up. The temperature dropped about 10 degrees in a matter of minutes. We made it back to our pit area just in time to start packing up prior to the rain coming down. When it did, it came down in buckets. By the time we got it all packed up, all four of us were soaked to the bone. The normal trophy ceremony was replaced by an impromptu gathering in the registration trailer, where Conor picked up his check and he and Peter both picked up their trophies. 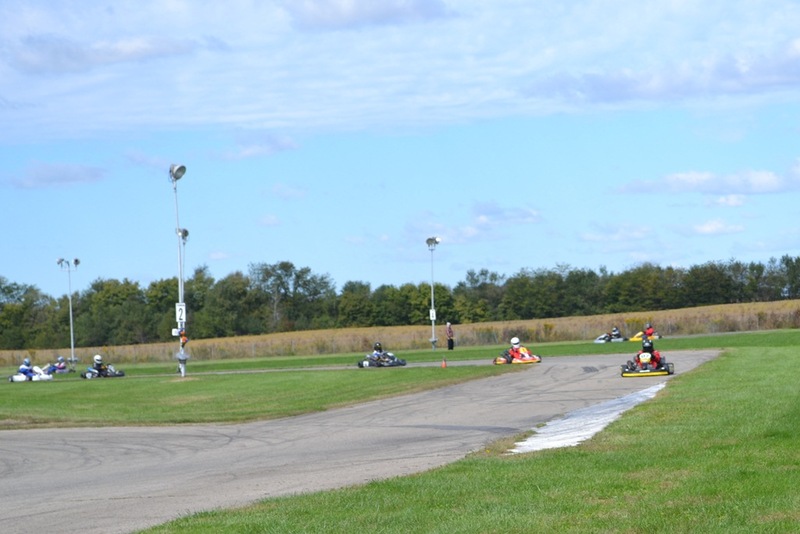 Our next race is Mid State of Ohio Kart Club Race No. 7 at Circleville Raceway Park on Sunday August 14, 2011. I’m hoping that all of our equipment will be dried out by then, but the weather forecast for Sunday does not look promising. Laura captured an amazing sequence of photographs of Peter during his qualifying session for the 2011 Commercial Point Grand Prix on Saturday, August 6, 2011 (click to enlarge). We had made a gear change prior to this session, and somehow, the bolts didn't get tightened. He got through the first few laps before the gear came loose. The last picture below captures the gear as it came off. The chain has not figured out that the gear is missing yet! He qualified ninth, but made significant improvements in his merchandise race later in the day and in his trophy race on Sunday. A full race report will follow. MSOKC Race No. 7 – July 31, 2011 – Conor’s Perfect Day… …on Peter’s Birthday! 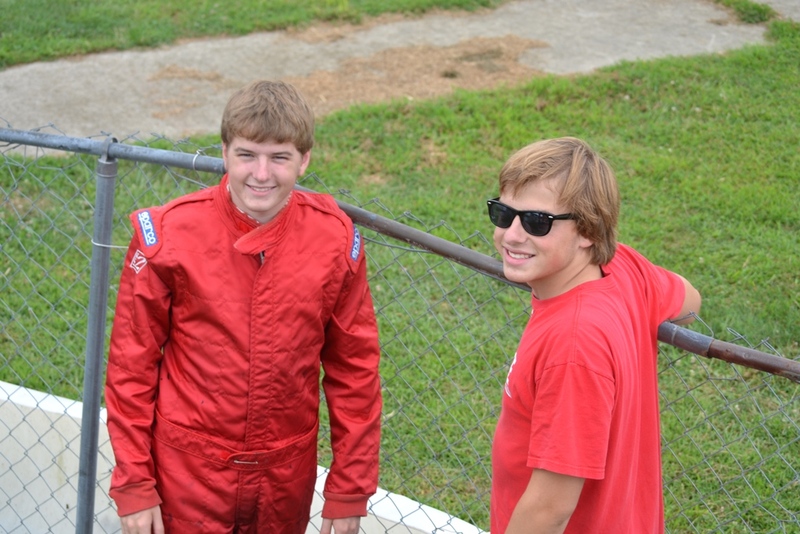 NEWS – Peter celebrated his 16th birthday this past Sunday during Mid State of Ohio Kart Club (MSOKC) Race No. 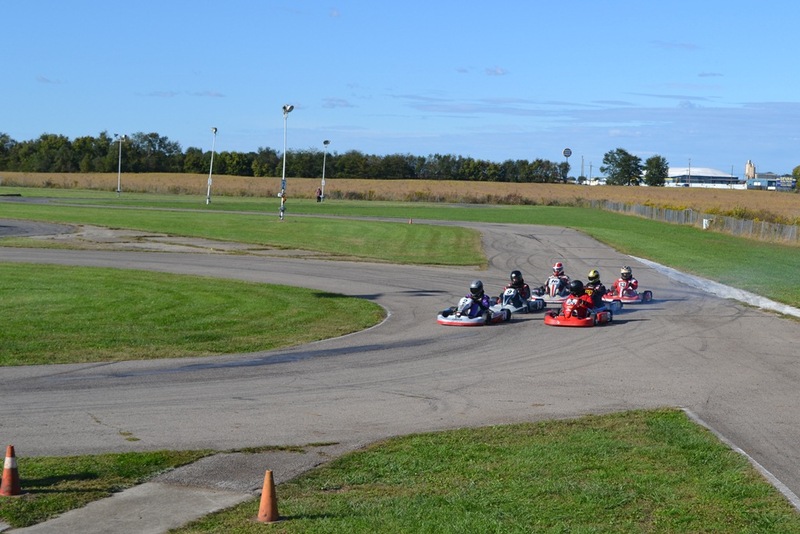 7, which was our first reverse direction event of the season at Circleville Raceway Park (CRP). We had just returned from Rhode Island where we visited Henry in his new apartment and had a relaxing vacation that included plenty of water. The house we rented was on a small lake and included the use of a variety of small watercraft. We also took a day trip on the ferry to Block Island where we toured around on rented scooters. The final day of our trip was spent cruising around Narragansett Bay and Newport on a large motorboat. PRACTICE – While we had nice weather in Rhode Island, it was still hot and humid in Ohio when we returned. It had rained the night before, so we had fog Sunday morning as well. During practice, we confirmed that we had corrected the brake rotor problem on Peter’s kart and we experimented with a replacement exhaust pipe on Conor’s kart. No track records were broken during practice as both the ambient and track conditions were less than favorable. SPEC 100 PIPE – Both Peter and Conor drew the pole position for their first heat race. Peter made a great start in his and motored off into the distance for another heat race win, setting the fastest lap of the race in the process. Starting from the rear in his second heat race, Peter let things settle down in front of him before beginning to apply pressure. While Peter was fast on Sunday, all of the other competitors in this class seemed to be running strong as well. Peter managed to make one pass entering Turn 4 on Lap 3, but that was as far as he could get. He did set the fastest lap of the race again, however. A first and a fourth earned Peter the third starting position for the feature. He maintained his position at the start and inherited a position on Lap 4 when the leader pulled off with a mechanical problem. While running second, Peter was pushing hard to catch the new leader when he dropped two wheels into the grass between Turns 6 and 5. This cost him two positions. He finished fourth, but it was good to see him once again have the speed to run up front. 80cc SHIFTER – Conor also made a great start in his first heat race and motored off into the distance for another heat race win, setting the fastest lap of the race in the process. Starting from the rear in his second heat race, everyone got away well which left Conor in sixth position at the end of Lap 1. On Lap 2, the two karts in front of Conor has a brief coming together, which let Conor slip past. Conor then executed a series of late-braking passes entering Turn 4. Each time, the kart being overtaken tried to late brake with him only to overshoot on the exit of the corner. The first came on Lap 3 and the next came on Lap 5. Having worked his way up to second, it took Conor several laps to catch the leader, during which he set the fastest lap of the race again. When he caught the leader, he had just enough time to make one last pass in Turn 4. Starting from pole position in the feature, Conor again made a great start and motored off into the distance for his third feature race win of the season in this class. This was the first perfect day of the season for anyone in this class (maximum championship points) and Conor’s first perfect day since he clinched the Yamaha SuperCan Junior championship in the season finale in October 2008. 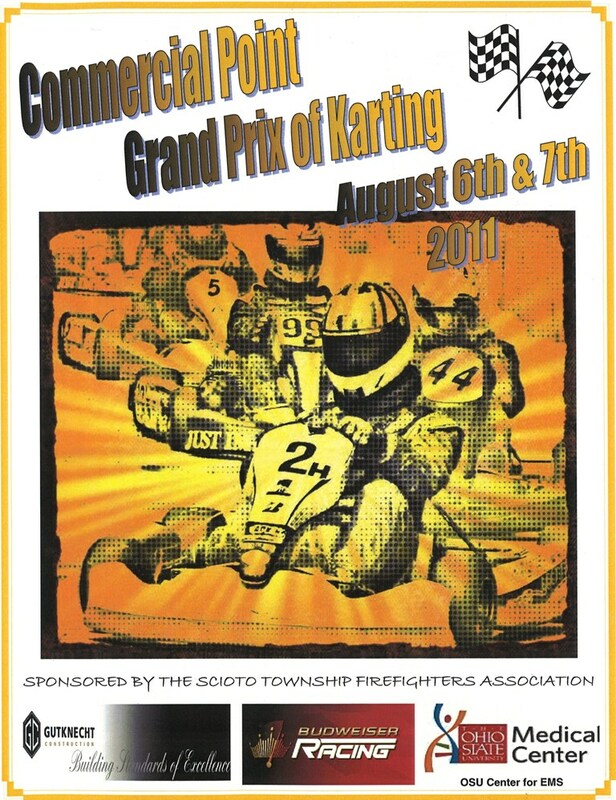 NEXT RACE – Next up is the Commercial Point Grand Prix on Saturday and Sunday, August 6 and 7, 2011. 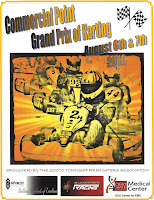 The CPGP (http://www.cpgrandprix.com/) is a street race through the village of Commercial Point, Ohio, and has been the highlight of the season for Bruce Brothers Racing in recent years. Peter and Conor will race on both Saturday and Sunday and Conor will race twice on Sunday. Admission is free, but passes must be purchased to access the pits. We will be under two beige-colored EZ-Up tents in the pit area near the starting grid. Extra chairs will be on hand. There will be food vendors, beer wagons, etc., and all proceeds benefit the Scioto Township Firefighter’s Association. Commercial Point is located approximately 14 miles south of Columbus, just south of Grove City. Conor qualified on pole (two heat race wins) and led every lap of the feature (click to enlarge). Peter had a heat race win, too. A full race report will follow. 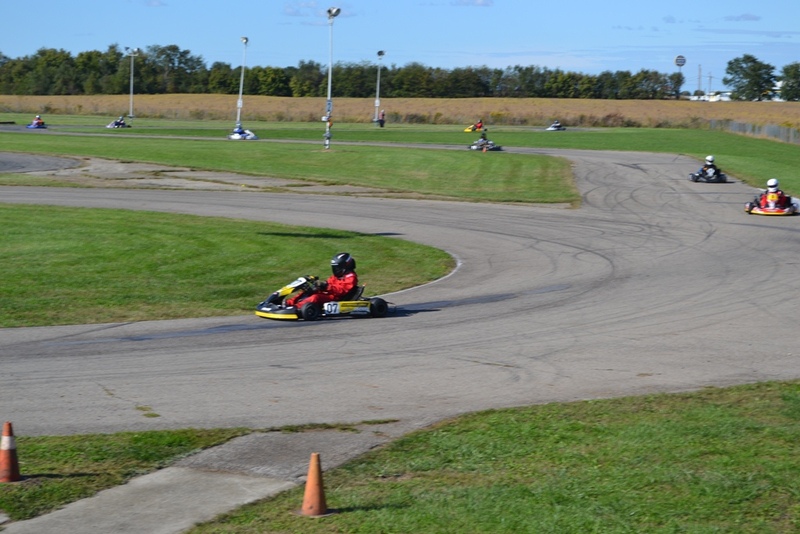 NEWS – Peter was back in action for Mid State of Ohio Kart Club (MSOKC) Race No. 6 after nearly four weeks in Italy. The rest of us (including Henry) had also just returned from a week in Kansas City where we were visiting family. For Race No. 6, Peter was looking forward to trying out the new racing shoes he got in Italy and Conor was looking forward to making better use of the speed we have recently found in his kart. Laura, who attends nearly all the races, needed to stay in Kansas City for an extra day to tie up some loose ends and missed this one. PRACTICE – The conditions last Sunday were excellent in the morning but the temperature and humidity increased throughout the day. Peter did some extra laps when we first arrived to re-acclimate himself. His lap times during practice were on par with the fastest karts in his class. While preparing for Race No. 6, we found a big crack in Conor’s exhaust. We had this fixed, and while scrubbing in new tires during practice, Conor set his fastest lap of the year so far (45.11 seconds). SPEC 100 PIPE – Peter started both of his heat races from the third position (of five). In the first, he maintained his position at the start and hung with the leaders for the first few laps, but began to fall into the clutches of the fourth place kart at about mid-way through. He held on to third to the finish, however. His second heat race was much like the first, although his lap times were increasing by about 0.2 seconds per lap. He got passed on Lap 6 (of 8) and finished fourth. At the time, we attributed his decreased pace to the increase in grip that the track was providing as the temperature increased. We would later discover that he had lost two set screws in one of his rear axle bearings, which was causing his brake rotor to rub one of his brake pads in left-hand corners. Unfortunately, we figured this out after his feature race. We made a few changes to “loosen him up” for his feature, in which he started fourth, but it became quickly apparent that there was still a problem. His lap times started out reasonably well, but as his brake caliper began to heat up, his lap times again began to increase. His final lap was a 48.24, while he had recorded a 46.89 in practice that morning. There was one retirement, so Peter ended up finishing fourth. 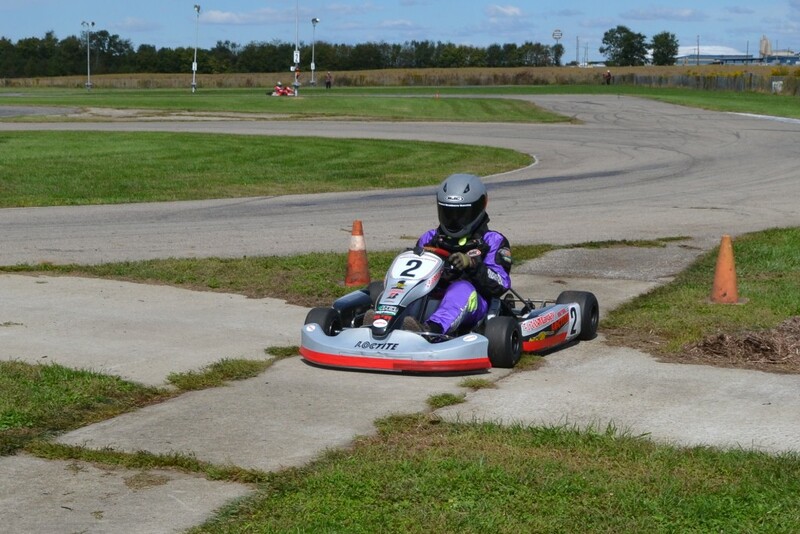 80cc SHIFTER – There were six karts in Conor’s class on Sunday. Conor started his first heat race from the sixth position. I don’t recall exactly what happened in the first few corners, but what I do remember is that he went for a pass in Turn 6 on the opening lap and ended up in the grass facing the wrong direction. He got going again but had lost a ton of time. He was extremely fast on new tires and caught up and made a pass on Lap 3, another on Lap 5, and another on Lap 6. One kart had retired, so with two laps to go, Conor was chasing down the leader. He came up about two kart-lengths short, but he recorded the fastest lap by over 0.3 seconds. When you start at the rear in the first heat race, you get to start on pole for the second. Conor had a great start and motored off into the distance for the heat race win. He again had the fastest lap by about 0.3 seconds. Conor found himself on pole again for the feature, but after an amazing string of awesome standing starts, he bogged the motor down this time. He only lost one position. 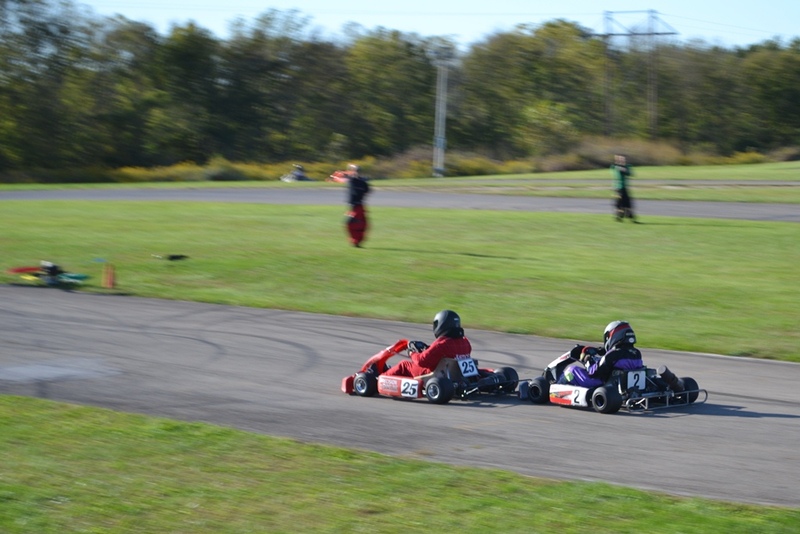 The leading kart was pushing hard to stay in front of Conor, and in Turn 8 on Lap 2, he dropped two wheels off the outside of the track and Conor was able to easily slip by. He once again motored off into the distance for his second feature race win of the year in this class. Fastest lap again? You bet – by over 0.8 seconds this time. While others struggled with worsening conditions, Conor’s lap times were consistent all day. NEXT RACE – Next up is MSOKC Race No. 7 at CRP on Sunday July 31, 2011, which is Peter’s 16th birthday. His axle bearing has been repaired and we have a few chassis adjustments to try, so hopefully his birthday will be a happy one. While Conor has been fast lately, his luck last Sunday was better than it was for Race No. 5. Hopefully that will continue. In the mean time, we’re off on another vacation – this time to Rhode Island where we will visit Henry, who is back in Providence for the rest of the summer, and spend some relaxing time at a nice house we’ve rented on a lake and near the beach. No caption necessary (click to enlarge). A full report for MSOKC Race No. 6 will follow. He's in the No. 2 kart that grabs the leads at the start. He leads until getting balked slightly while being passed by a kart from a faster class. Thanks again to Frank Oyer for posting. MSOKC Race No. 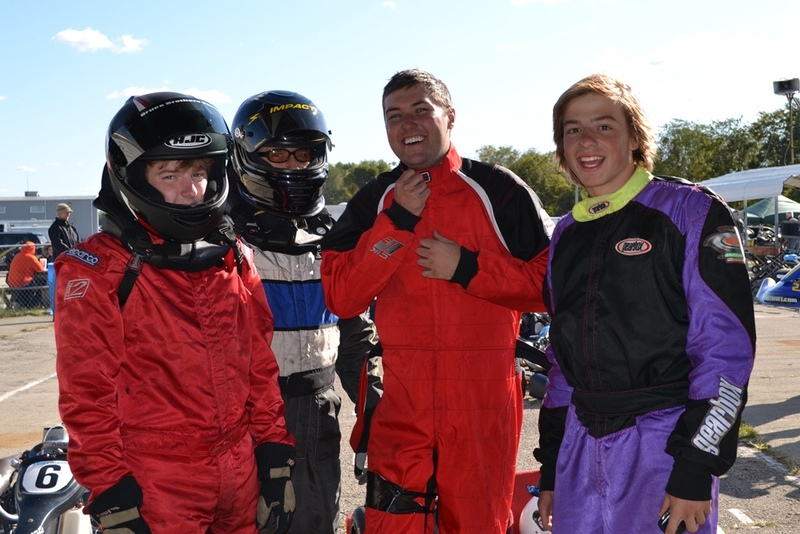 5 – June 25, 2011 – Conor Gets a Win… …in Peter’s Kart! NEWS – Peter is in Italy again this summer with our neighbors and good friends the Rizzoni’s, so he was unavailable for Mid State of Ohio Kart Club (MSOKC) Race No. 5. We took the opportunity to experiment with a new exhaust header on our Yamaha Spec 100 Pipe kart by putting Conor in the seat. Conor had never done two classes in the same day before (see picture below - click to enlarge), so it was a good opportunity to test his endurance as well. PRACTICE – Race No. 5 was another Saturday night race at Circleville Raceway Park (CRP), although this was a qualifying format event instead of the normal heat race format. We arrived a bit early again to give Conor a chance to acclimate to a chassis in which he is very familiar but with more power than when he won the Junior SuperCan championship in this kart. Conor was able to record some impressive lap time both in free practice and during class practices in both the Spec 100 Pipe kart and his 80cc Shifter kart. We had new tires for qualifying for the 80cc shifter kart, but Conor would have to make due with some very used tires on the Spec 100 Pipe kart. SPEC 100 PIPE – The Spec 100 Pipe class was combined with the faster TaG class, which had only one entry. In the Spec 100 Pipe qualifying session, Conor qualified second and missed pole position by just over 0.2 seconds. Only 0.4 seconds covered the rest of the field (five karts total), however. This class allows the choice of two engines. The pole sitter uses the other engine, which is fast over a lap distance but does not accelerate as well as the Yamaha. In the heat race, Conor was able to gain the lead going into the first corner. The faster TaG kart, which had started in the rear, tried to pass both the second place kart and Conor going into Turn 5 on Lap 4 (of 8). She squeaked by, but caused Conor to lift slightly which allowed the second place kart to get by, too. A pair of seconds earned Conor the second place starting position for the feature. He once again passed the pole sitter going into Turn 1. Conor was able to extend his lead a bit over the first few laps this time. When the faster TaG kart came up through the field, she could only manage get by the second place kart going into Turn 5. This caused him to lift, and because of his poor acceleration, he dropped back by about 10 kart lengths. Just as all appeared to be smooth sailing to the finish, the TaG kart clipped Conor in the left rear going for an aggressive pass in Turn 10 on Lap 7 (of 10). The TaG kart had a half spin, and Conor was turned around by about 90 degrees, but he was delayed only slightly and hung on for the feature race win. 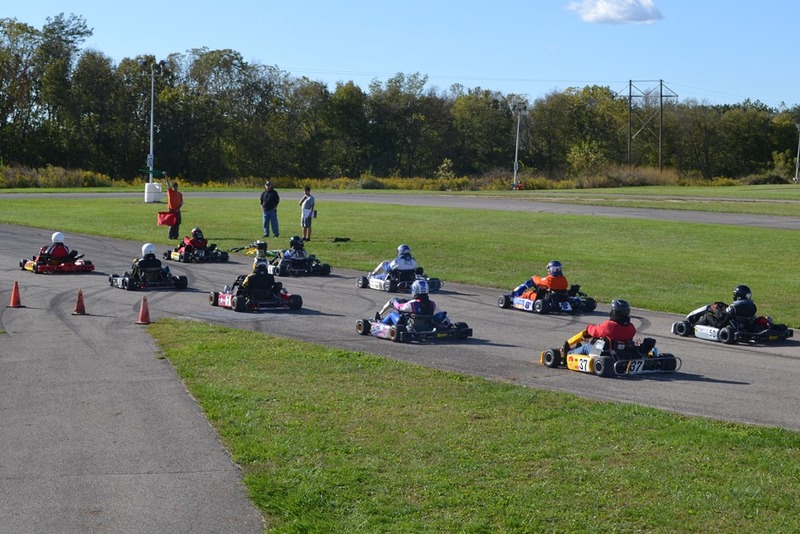 80cc SHIFTER – The 80cc Shifter class had the biggest field of the season so far this year – 10 karts. This included a former Junior SuperCan competitor of Conor’s who in now racing for Andretti Autosport in USF2000. We seemed to have nailed the setup for the new set of tires we put on Conor’s kart for the qualifying session, as Conor qualified on pole by over 0.4 seconds. In the heat race, the second place qualifier jumped the standing start by a mile. He was rolling past Conor with a head of steam before any of the other karts moved (see picture sequence video below). The rules state that, when someone jumps the start, the race is supposed to be red flagged, the offender moved to the rear of the field, and the race re-started. Well, that didn’t happen. Conor fell into second place behind the offending kart and applied significant pressure over the first seven laps. He made several passing attempts, but each time, had to fall back in line. The leading kart seemed to be focusing on defending his position, which resulted in lap times much slower that Conor’s qualifying time and caused a bottleneck of four karts behind him. Conor’s best opportunity for a pass came entering Turn 3 on the final lap. Conor went wide to set up an inside pass in Turn 4, but got hung out to dry when the leading kart left no room. Conor dropped to fifth before he could get back in line, which is where he finished. A first and a fifth earned Conor the fourth starting position for the feature. Conor gained a position at the start, but lost it on Lap 4 to another professional driver (and the champion of this class last year) who was substituting for a regular driver who was complaining of back pain. NEXT RACE – While it was fun to see Conor get a win in the Spec 100 Pipe class, it was frustrating to see what happened in the 80cc Shifter class. Prior to the start of the 80cc Shifter feature race, there was a hastily-called meeting to discuss the consequences for jumping the start. While no penalties were handed out this time, a stern reminder of what is supposed to happen was given. This will hopefully prevent a recurrence in the future. Our next race is MSOKC Race No. 6 on Sunday July 17, 2011, at CRP. Peter will have just returned from Italy and the rest of us will have just returned from a week in Kansas City where we are visiting family. In between all of this, Laura and I had relaxing week of vacation in Colorado for our 25th wedding anniversary, and Henry is home from Providence for a few weeks. Yes, it’s been a busy summer. He's in the No. 2 kart that leads from green to checkered just in front of the red kart. Thanks to Frank Oyer for posting.